AnyMP4 iPad to PC Transfer Ultimate is the best iPad to PC Transfer program, with it, you are able to transfer almost all the iPad files like music, movies, TV shows, podcast, iTunes U, ringtone, ePub, PDF, audio books, camera roll, camera shot, etc. to computer. Also, this perfect software allows you to backup iPhone Contacts and SMS to your computer to avoid missing some important message. Besides, it enables to sync iPad files to iTunes. Apart from that, this amazing software supports any version Apple device like iPhone/iPad/iPod and it compatible with the latest iOS 7. 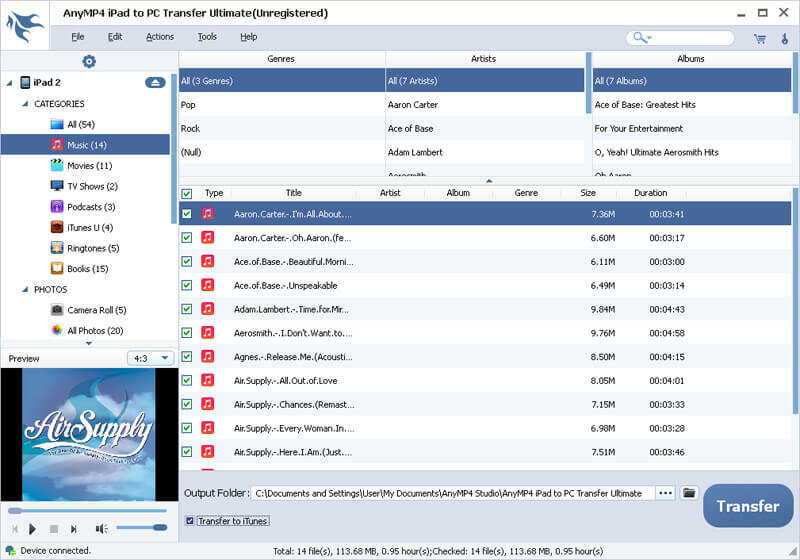 AnyMP4 iPad to PC Transfer Ultimate can help you transfer all iPad files (music, movies, TV shows, podcast, iTunes U, ringtone, ePub, PDF, audio books, camera roll, picture, voice memos, etc.) to PC. Also, you are able to sync some of the iPad files to iTunes for backup. AnyMP4 iPad to PC Transfer Ultimate can be also act as iPod to PC Transfer or iPhone to PC Transfer, because it supports all versions of iPad, iPhone and iPod devices. Also, you can use this wonderful software to backup iPhone SMS and Contacts to your computer. AnyMP4 iPad to PC Transfer Ultimate has a built-in player in the lower left corner to help users preview the video/audio/photo effect conveniently. Also, the search box of this software enables users to find what they need quickly. Besides, once connected to the computer, your device will be detected automatically. So it is a good choice for you!